Schedule- The House and Senate are back in session this week after the Independence Day Recess. Farm Bill Heads to Conference– The farm bill is headed to conference after passing narrowly in the House and overwhelmingly in the Senate. Before tackling differences in the bills, both chambers must determine which lawmakers will serve on the committee. The main challenge is slated to be the differing approaches to the Supplemental Nutrition Assistance Program (SNAP). The House’s version of the bill tightened SNAP work requirements for able bodied adults without dependents. Dairy, Cherries Feeling Effects of U.S. Trade Actions- Last week, Mexico and China ramped up retaliatory trade measures, hitting producers across the agriculture sector. The trade war between the U.S. and China may have “officially” started on Friday, but in past weeks, cherry exporters have seen a marked tardiness in customs inspections at Chinese ports. Cargo inspections that normally take three to four hours are now subject to selective checks, taking between ten days and two weeks to clear. Meanwhile, the dairy industry is seeing tariffs from Mexico and China affecting as much as $578 million and $408 million of dairy goods, respectively. More than 60 cheese and dairy producers wrote to the Trump administration last month, saying the trade war puts the U.S. share of the Mexican market “in grave jeopardy.” Nearly a fifth of milk produced in the U.S. leaves the country, and more than half of all U.S. cherry exports go to China. Washington State to Vote on Grocery Taxes- On Thursday, Initiative 1634 submitted a petition with over 290,000 signatures that, if passed, would bar local governments from placing new taxes on soda or other grocery items. The measure would not roll back existing taxes, such as the tax on carbonated beverages in Seattle, but would prevent other local governments from enacting them. The “Yes! To Affordable Groceries” campaign is supported by a coalition that includes unions, small business owners, and farm groups. Tara Sweeny was confirmed to be the Assistant Secretary of the Interior. Several nominees from the Department of State were confirmed as Ambassadors to the following countries: Dominican Republic, European Union, Kingdom of Belgium, Republic of Korea, Republic of Trinidad and Tobago, and Republic of Zimbabwe. The House Committee on Foreign Affairs will discuss “Advancing U.S. Interests in the Western Hemisphere”. The House Committee on Natural Resources will hold a markup on several bills. House Foreign Affairs Subcommittees on Terrorism, Nonproliferation, and Trade and Asia and the Pacific will hold a joint subcommittee hearing on China’s Predatory Trade and Investment Strategy. Farm Credit will host a discussion on the transition from military life to farming. They will be joined by Senators Roberts (R-KS), Isakson (R-GA), Tester (D-MT), and Stabenow (D-MI). The event is at 12 in 328-A Russell. The House Committee on Natural Resources will conduct an oversight hearing on “The Essential Role of Livestock Grazing on Federal Lands and its Importance to Rural America”. The Atlantic Council will hold a discussion on Mexico’s new president, Andres Manuel Lopez Obrador and the implications for Mexico, NAFTA, and beyond. The FDA will hold a public meeting on Foods Produced Using Animal Cell Culture Technology. 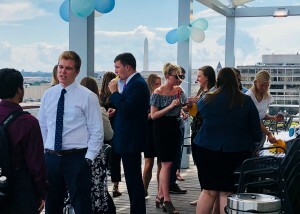 On Thursday, Michael Torrey Associates hosted an Ice Cream Social for members of the Ag Intern Network. Michael Torrey spoke to the group , sharing his career history, viewpoints on the biggest obstacles facing the food and ag space today, and tips for a successful internship. 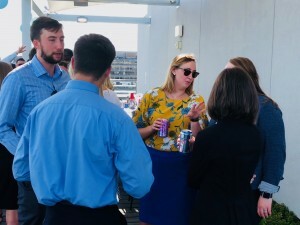 Members of the MTA team also answered questions and shared insights with summer interns. 83 total days until the farm bill expires (Sep. 30, 2018).